Robert (Bob) (Smarty Pants) Arum made a grave mistake being #1 in his class in Law School at Harvard University. We had a planned picket line at the Fort McDowell Casino in Arizona. I had three (3) bus loads of plumbers, teamsters, ironworkers and fighters along with their parents. 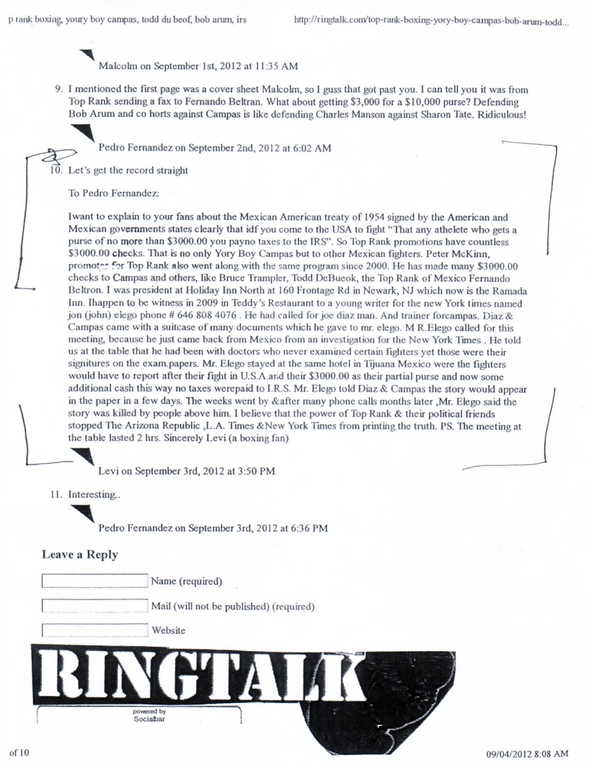 What took place the day before the planned picket line to protest the $5,000 bad check along with a receipt which was forgery of my name, a false affidavit on how Top Rank promoter Peter McKinn I,II,III made in his lawyers office on 16th street in Phoenix, “Milo” is the lawyers name. The Indian tribe heard about the picket against Top Rank fights. The gentleman who called me asked, please do not picket because it will disrupt our business. I called the picketing off in respect to the Indian tribe who owned the casino. Well Bob “Smarty Pants” Arum didn’t know about this conversation. So Smarty Pants says to Peter McKinn I,II,III in front of the “Double Dipper” Norm Frauenheim of the Arizona Republic, “Peter you disappoint me, where is Joe Diaz and his pickets”. Norm put Smarty Pants statement in the Arizona Republic the next day. This was Smarty Pants big mistake. Smarty Pants was part of this fraud case against myself and Yory Boy Campas. He has sent a $100,000 bout sheet and swore under oath in an affidavit he presented to a federal judge, Susan Boulton. 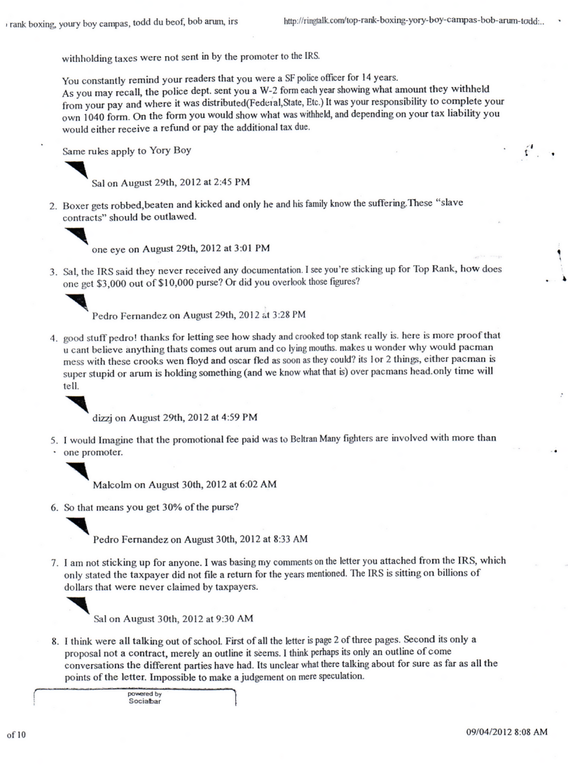 Smarty Pants presented his affidavit in 2007 to the judge through his lawyers Lewis and Rocek. Look at the bout sheet, One hundred thousand dollars for the WBC World Title against Oscar De La Hoya who received Eleven Million Dollars. Yet on the stub they took out fees for two(2) world titles??? How Come?? Then 3% of $100,000 is $3,000 not $18,000. The $20,000 advance of Feb. 20th 20003 the check could not be cashed because it was never signed yet they took $20,000 advance out of the check. Yory Boy Campas was left with a $20,975 amount. The two (2) titles were the WBC and WBA. Campas only signed for the WBC title, not the WBA. Also a $1,000 manager’s license fee for a WBA fight. Are You Kidding?? A piss test (urine) for $10,000? Who are you fooling? Todd De Bueff or Bruce “Matchmaker” Trampler?? How Come check #10596 was never signed? How Come?? Acct. #010596-053107989:000480117364? In 2001 a contract was sent to Campas to fight Oscar De La Hoya for $300,000. When Campas signed the $100,000 bout sheet 2 weeks before the fight in 2003 he saw all the zeros,0000000 and thought it represented a 1 million dollar contract. Campas only has a 6th Grade education. He Smarty Pants you must have felt really big since you had a Harvard Law Degree and could cheat an honest fighter who had a 6th grade education. You are thief!! Smarty Pants you are more than a felon, what you and your friends did to Campas is beyond criminal. I have been told you worked for the US Justice Dept. You don’t know what justice is!! You are rotten to the core!! You only care about getting richer and richer off the blood, sweat and tears of all these poor fighters. Bob get lost!! I have to give credit to Mr. Bob Arum, C.E.O. of Top Rank Promotions. He outfoxed the F.B.I. after they spent millions to catch him and Vice President Bruce Trampler (Alias) matchmaker). Poor Henery Schrupps, a great F.B.I. agent who’s hard work went for naught. Bob Arum even fooled the I.R.S. out of monies. Poor Mr. Robinson of the Criminal Division of the I.R.S. Bob even fooled the Justice Department. Poor Bobby Lee, President of the I.B.F., he went to jail for 6 years and Bob Arum only got 1 Felony count and no jail time. There are many public records to prove this. You see when you are a graduate of Harvard University, at the top of your class, you can get away with anything. Too bad Mr. Arum doesn’t remember me at the Hilton Hotel in Secaucus, New Jersey when I attended the Awards Ceremony for Buddy McGirt and Al Certo. Why Bob Arum allowed a street thug like Peter McKinn the I, II, or III to attack me, my gym, my kids (boxers), all their families and destroy my name. Finally in April 2011 Bob Arum’s Top Rank associate Peter McKinn admitted before the court that he forged my name. McKinn also admitted to having no money in the bank account he wrote a check to me against and admitted to falsifying an affidavit with Gabriel Esqueda. There are several sections below which have multiple pages- Please click on the box with the arrow in it and the pages will become full size and you can click on them to view.